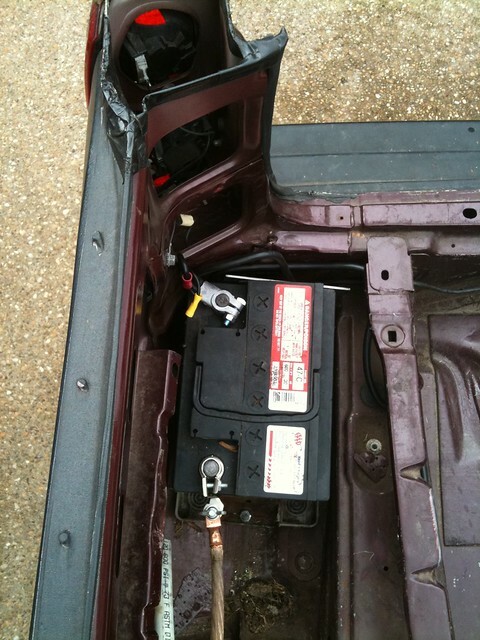 The stock battery location for our Volvo, like many cars, is in the very front of the engine compartment. For our 940, it’s actually nearly as far forward as is possible, underneath the right-front headlight. One of the major components of how a car handles is its weight distribution—generally the closer to 50% over each axel is preferred. Since the batteries weight 40 pounds or more, moving it from one end of the car to the other can have a significant effect on the weight balance, especially when those ends are as far apart as in our Race Wagon. As such, I moved the battery from it’s stock location, a rusted-out pan in front of the right-front wheel, to a clean, solid cavity near the right-rear tail lamp. Not only is it more secure, we ought to see an improvement in handling.